Acclaimed New York Times cat behavior science author published in 4 languages, Mieshelle Nagelschneider was the recipient of the Golden Purr Award for her contribution to cat behavior. She is a cat expert for National Geographic documentaries and publishing on cat behavior and the 37 species of wildcats. Learn more about her past and current formal study in animal behavior and animal welfare at Oxford University, The University of Edinburgh – The Royal School of Veterinary Studies, and her experience at Harvard University. Specialized animal behavior study has helped enable her to solve cat behavior issues for cat owners from Australia to Norway since 1999. See our outstanding clinic success rate here. Award-winning Certified Cat Behaviorist and Cat Whisperer Mieshelle has helped thousands of cat owners since 1999 and her formal study in animal behavior has enabled her to solve some of the most “perplexing” cat behavior issues she is presented with. Read over 200 client testimonials and case study reviews. 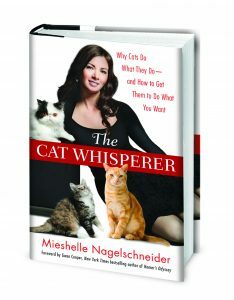 Mieshelle Nagelschneider, created the first science-based scholarly-cited cat behavior book, The Cat Whisperer, Random House Publishing (with co-writer Cameron Powell). In addition to solving your cat’s behavior issue, she will show you how feline evolutionary biology, internal factors and external factors play a role in your cat’s behavior Issue. Watch Mieshelle as the cat expert on National Geographic’s one-hour documentary “The Wild Side of Cats”, Howie Mandel’s Animals Doing Things on Nat Geo, the Today Show, The Hallmark Channel, and NBC Dateline. Mieshelle is considered the leader of the cat behavior specialty and is the world’s most renowned and sought-after cat behaviorist and cat behavior authors. Random House Publishing published the scholarly cited, most complete and up-to-date cat behavior book ever featured in The New York Times, The Cat Whisperer, (available on Amazon now) and just recently finished filming Howie Mandel’s Animals Doing Things for National Geographic, Animal Planet’s Must Love Cats guest starring as “The Cat Whisperer”, NBC Dateline’s “The Secret Lives of Cats and Dogs”, The Today Show, National Geographic one-hour documentary “The Wild Side of Cats” and guest starred as The Cat Whisperer on MTV, and is the spokesperson for Arm & Hammer Litter as The Cat Whisperer and Cat Behavior Expert and the Cat Behavior Expert for Comfort Zone. She has traveled the globe from the Philippines to Australia as a spokesperson and cat expert for the major cat brands. Mieshelle in Modern Cat Magazine as Their Resident Cat Behaviorist. 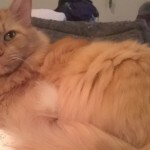 In four decades of living with cats, training them, studying them, treating them as a veterinary assistant, listening to them (even more valuable than “whispering” to them) and of course consulting on their unwanted behaviors, she has helped thousands of cats and their owners, live happier and healthier lives. 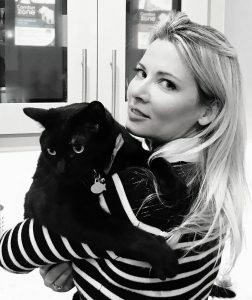 In addition to being the spokesperson for Arm & Hammer Cat Litter and was the Cat Behaviorist Expert Panel for Comfort Zone Pheromone products in 2018, Mieshelle frequently lectures at veterinary conventions and around the world at animal welfare events as the keynote speaker and expert cat behaviorist. 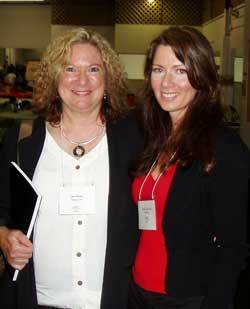 Her most recent lecture was for the International Behavior Education Convention for the Humane Society/SPCA in Toronto, Canada and as the International Cat Behavior Expert for Whiskas in Australia. When Best Friends Animal Society needed a cat behaviorist to be the voice for shelter felines needing homes, they enlisted Mieshelle’s help. She continues to tour the globe educating cat owners on cat behavior and welfare and elevating the status of the cat from Australia to the Philippines. She is sought out, hired, and referred by veterinarians around the U.S., cat shelters, and wild-cat sanctuaries. When Hammacher Schlemmer needed a cat expert to test and review over a half-dozen advanced litter-box technologies, they came to Mieshelle. As an anti-declaw advocate, she has spoke for Dr. Jenny Conrad and The Paw Project movie release on the Today Show and helped save cat’s lives speaking at the NKLA events in L.A. as The Cat Whisperer. With Team Cat Whisperer, she has studied the foraging habits of 6 species of wildcats with a team of 20 biologists on a private cloud forest reserve in Costa Rica. The observations of these 6 wildcat species that are native there will become a part of her second upcoming book sequel to, The Cat Whisperer. She has worked with thousands of cat owners and many vets, and of those clients who follow her recommendations, including her proprietary C.A.T. Plan™, has helps save thousands of cats’ lives each year since 1999. Mieshelle’s science-based Cat Whisperer book published in 4 languages has been sought out by and expertise featured on Nat Geo Wild, The Today Show, Animal Planet, Hallmark Channel’s Home & Family Show, Reader’s Digest, Parent Magazine, Whiskas live forum, Martha Stewart Radio, The New York Times, Yahoo, LIFE, New York Post, NBS Dateline, Boston Globe, Arm & Hammer litter, Comfort Zone, Lifehacker, Catster, MTV, The Dodo, Modern Cat Magazine, Pawnation, Animal Aid, Cat Fancy Magazine, USA Today, Fox, This Wild Life, Pet 360.com, Animal Rescue Site, Free Kibble Kat, The Divine Cat, Real Simple Magazine, Salon.com, Petside, New Republic, Best Friends Animal Society, NKLA, Stray Cat Alliance, The Daily Cat, The Washingtonian, The Toronto Star, The Sunrise Show, The Circle, and many others. See our Media Room for the latest. Mieshelle is a popular resource for many cat-only veterinary practices nationwide, over 40 wild cat sanctuaries, and countless animal shelters needing expert advice on feline behavior. Mieshelle is founder and director of The Cat Behavior Clinic and has spent 25 years working professionally with cats of all kinds — from domestic cats to large exotics of the tiger family. Mieshelle lives in the Pacific Northwest with 12 other animals, including seven cats (Jasper Moo Foo, Rhapsody in Blue, Clawde, Barthelme, Lady Josephine, Farsi Noir, and Braumwell), the cats’ bird friend Pidgeoto, a Savannah Monitor, their dog-toy Piccolo (a Teacup Chihuahua), and the cats’ personal body guard, a soulful Great Dane named Jazzy. Oh, and Nagelschneider is her real name — it’s German for “nail clipper,” and we’re not making that up. She’s also known for her uncanny ability to trim cats’ nails without needing to restrain them. Mieshelle’s award-winning breakthrough book not only solves cat behavior issues, it also prevents them. The Cat Whisperer (Random House Publishing), is available everywhere.